Delegate: Dr. M. A.Atmanand , National Institute of Ocean Technology. The project on first ever Ocean Thermal Energy Conversion (OTEC) powered desalination plant in Kavaratti, Lakshadweep Islands, was approved by the Government. As part of the product development for usage in ports, a wave powered navigational buoy was installed successfully with additional oceanographic sensors off Kamarajar Port, Chennai. The National Institute of Ocean Technology (NIOT), an autonomous institute under the Ministry of Earth Sciences (MoES), has been entrusted to develop technologies pertaining to ocean energy. NIOT also advises the Ministry of New and Renewable Energy (MNRE) (which is primarily responsible for tariff fixation and policy formulation for renewables), on ocean renewable energies as and when required. The Ministry of Earth Sciences, under the Government of India, supports the programme on Ocean Energy and Desalination at NIOT. Unidirectional turbine (left). 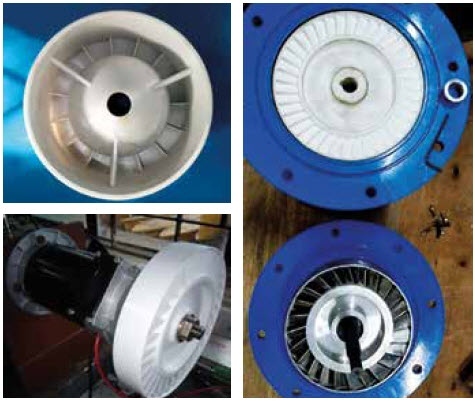 Bidirectional turbine (right). NIOT has been working on Oscillating Water Column (OWC) principle based wave energy devices for some years. Continuing the ongoing development on the wave powered navigational buoy, NIOT team has successfully demonstrated an all weather floating wave powered navigational buoy using wave energy for powering a beacon lamp on the top of the buoy and oceanographic sensors. The buoy has been continuously operating for several months near the navigational channel of Kamarajar Port, in Chennai, India. Measured oceanographic parameters have been hourly transmitted to port authorities through GSM communication. Both unidirectional and bidirectional impulse turbine for wave energy devices have been tested in open sea trials of wave powered navigational buoy for their performance evaluation. 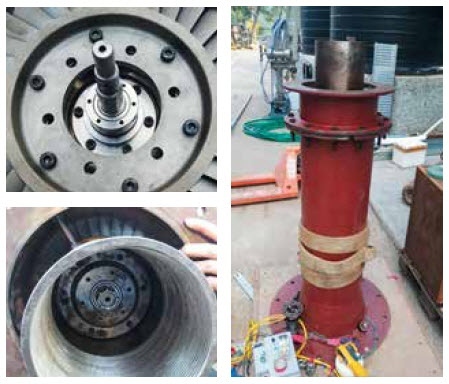 The performance of the bidirectional turbine developed in collaboration with Indian Institute of Technology, Madras (IIT-M), is being compared with that of the unidirectional turbine. Experimental studies on various components of Ocean Thermal Energy Conversion (OTEC) and Low Temperature Thermal Desalination (LTTD) have continued in the recently established laboratory at NIOT, Chennai. The plant can be operated for the Open Cycle OTEC, Closed Cycle OTEC as well as Desalination in various seawater temperature scenarios. The laboratory is equipped with a comprehensive supervisory control and data acquisition (SCADA) system. The design and several activities for the project on establishment of the OTEC powered desalination plant in Kavaratti, Lakshadweep Islands, have been initiated. A wave powered navigational buoy has been tested several times before hand over to the Kamarajar port in Chennai. It has been installed in the navigational channel of the port. As part of the transfer of technology to Industry, NIOT is building two more wave powered navigational buoys. These are planned to be deployed at two different ports in India. NIOT also has a design ready for a hydrokinetic turbine of installed capacity 5 kW for the Andaman and Nicobar Islands. A conference of Energy & Water is being organized on 7-9 March 2019 at NIOT campus. 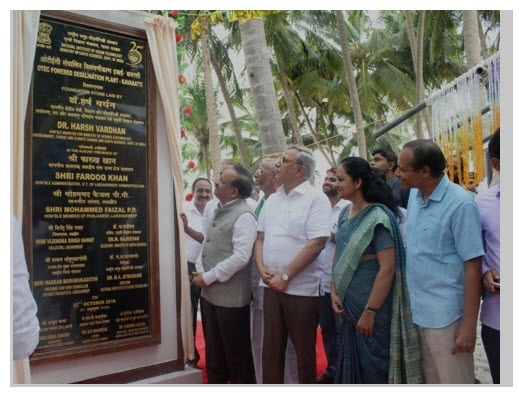 The Foundation Stone for OTEC powered desalination plant was laid in Kavaratti by Honourable Minister of Science and Technology, Earth Sciences and Environment & Forests, Government of India.